Rugs protect the floor and tie in the design. Placement of design features on a floor, such as an area rug, are vital to ensuring that your room creates the visual appeal you desire. Rugs also protect and enhance a floor. 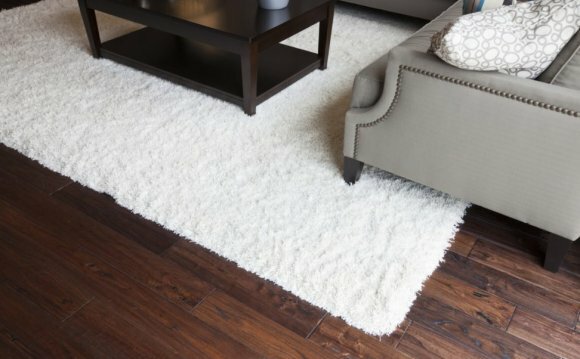 When the rug accompanies hardwood floors, you'll choose from a number of different colors so that your rug either blends in or contrasts with the overall color scheme. If you desire a blended look for the room with colors that match in the upholstery, walls and accessories, choose an area rug that matches the color of the floor. Use a neutral color on the floor rug to ensure that the eye is not drawn to the floor but rather to any features that you have decorating the wall. For example, a large wall tapestry or a bay window with sheer drapes may be the focal point of the room, so use a neutral-colored rug to match the floor if you want the eye drawn to the window. Because contrasting colors tend to draw the eye, use a contrasting-colored rug if you want to highlight a focal point on the hardwood floor. For example, if there is a hardwood floor with a ceramic tile inset, consider placing a rug that contrasts the color of hardwood to draw the eye downward. Contrast the color of the rug in comparison to the floor to pull the eye away from the wall, such as in the case of small windows where heavy drapes are used due to a lack of panoramic vistas. Many hardwood floors have numerous colors spread throughout the natural grain of the wood. While stain will darken the wood and keep things more uniform in color, secondary colors will still show through. Match the rug to these colors to create a blended feeling, as opposed to merely neutral. Alternatively, choose the secondary colors of the room as the color of the rug, such as the color of the baseboard trim. If you have wallpaper, for example, with a specific print that has various colors throughout, consider matching the colors of the prints as opposed to the color of the actual wall. Upholstery is another important design element of the room, ranging from the sofa and loveseats to the drapes on the windows. They do not always match the color of the hardwood floor. Regardless of the floor color, matching the upholstery is another way to tie in the rug with the rest of the room without directly contrasting or matching the color of the hardwood floor. If your upholstery has patterns, consider using the same type of patterns on the rug to carry on with the theme of the room.